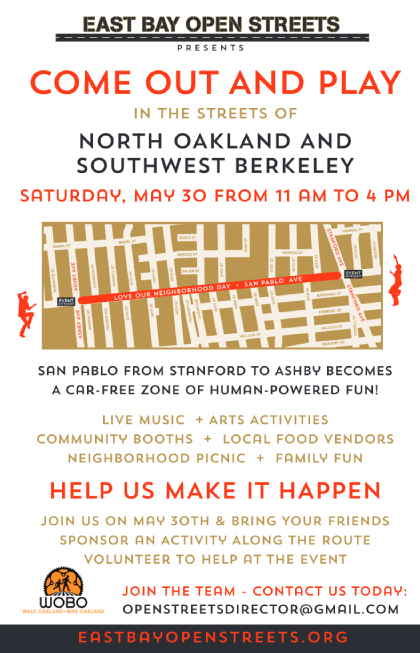 For the second year, our Golden Gate/Southwest Berkeley neighborhood invites you to participate in the open streets event, Love Our Neighborhood Day, on Saturday, May 30th. For those who missed last year’s event, this open street event is a block party for people to experience our neighborhood in a whole new way. From 11am to 4pm, San Pablo Avenue will be closed to traffic and car-free from Ashby to Stanford, about a mile-long stretch, so that people can walk, bike, skate, dance, and play in the open street, your street. You won’t want to miss this amazing day. Our route line-up brings 60 different interactive activities to participants.  The street will close at 9:00 a.m. on Saturday, May 30th (5/30). No cars may be parked on San Pablo at that time. The street will re-open to vehicles and parking at approximately 5:00 p.m.
 Is your business going to be open on Saturday, May 30th? Great! Be prepared for increased foot traffic, and do let your regular customers know that busses will be detoured and they will need to park away from San Pablo, as the street will be closed.  This is your chance to show off your business by giving incentives for new potential customers.  AC Transit will be routing the 72, 72M and 72R buses around the event route from 9am to 5pm, using Ashby, Sacramento, Market and Stanford before resuming onto the regular route on San Pablo Avenue. Tweets about "#loveourlakeday" "#loveourhood" "#oaklavia"